Mansfield and Lewis — Not the Physique, but each has the face, if not the intellect of a Rugby Player. Waldron is a director of the U.S. Rugby Foundation and has played, coached and broadcast rugby on a regional, national and international level. He has also been on whitewater rafting expeditions (successfully tackling the Upper Yangtze River in China) and motorcycle adventure trips on six continents. Jay is a follower of this blog and was very positive about The Ship even noting that it had been a long-ago hangout, of sorts, for Portland Rugby Club players. This raised some initial concerns on my part as I wanted to drink from a glass rather than eat one……A little more research, however, uncovered the fact that their impact was relatively mundane – the site of the Rugby Club’s “Book and Brew” discussions which will be addressed below. What do You Mean Credit??? 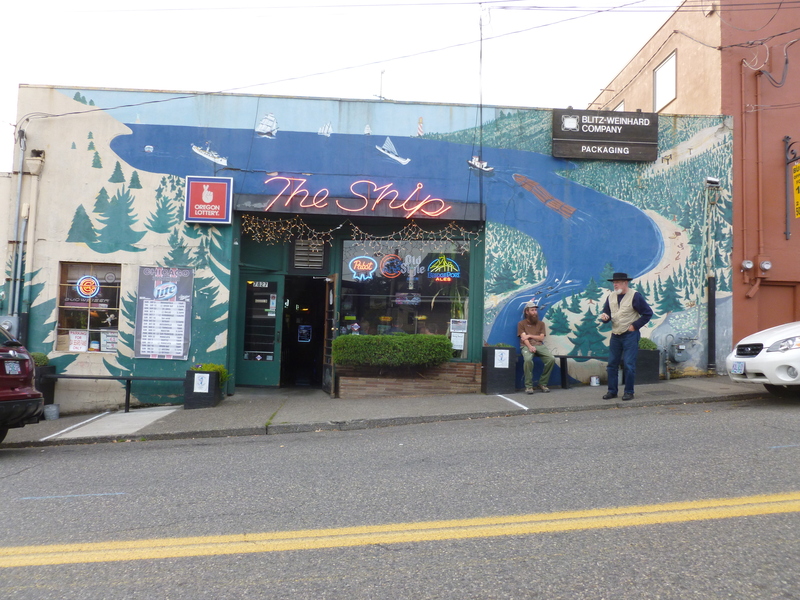 The Ship may be one of the few bars or pubs in Portland to totally disdain credit cards. It’s cash only and no tabs – pay as you imbibe! Times change, however. Last year was the first time The Ship offered liquor and Candace, the Manager, (who was also very helpful) said they might consider credit next year. All of the people in the photo collage at The Ship have one thing in common — they paid cash for their beer! Peanut Demolition Day – Each Thursday – the day we were there – each table has free peanuts in the shell all day. The shells hit the floor when you discard them…….. The rules on the two pool tables are also worth noting. If you drop a cue, the fine is 25 cents and 50 cents if a ball goes off the pool table – according to Debbie, the bartender, it is a “maintenance fund” for pool table repairs. You will find no menus at The Ship. The food, which is what you would expect at a dive bar – that’s a compliment – is on a blackboard above the bar. And the Rugby Club’s past “Book and Brew” discussions??? As an example, there was heated debate on the non-fiction classic, “The Iron Man – How Shelby Donovan Revolutionized the Chicago Dry Cleaning Industry” and some awkward moments when former Oregon Governor Vic Atiyeh’s presentation, “What Can Your Rug Be?” was not quite what the rugged jocks expected……. The scene at The Ship during a heated debate by “The Book and Brew” group. The Asphalt prefers Budweiser….with an oil chaser….. This entry was posted in Dive Bars and tagged Big Buck Hunter video game, Chicago Bears, City Club of Portland, Mike Ditka, Multnomah Village, Neil Young and Crazy Horse, Oregon Governor Vic Atiyeh, Pabst Old Style Beer, Portland Rugby Club, Schwabe Williamson Lawyers Jay Waldron and John Mansfield, Seattle's Best Dive Bars, Tator-tot Hotdish, The Raconteurs, The Ship Tavern, traffic engineer bar joke, Upper Yangtze River, US Rugby Foundation by thebeerchaser. Bookmark the permalink. Ah yes, Sir Donald…. The Ship Inn resembles what most Chicago Bears or Cleveland Browns fans would convert their one-car garage into, if they could. It is a “man cave” of a place (girls accepted). You won’t find this earthy quality out in L.O….. Oh no, barristers must drive from the ‘burbs to visit…. Worth the drive.